So we were on our way to Matheran again. After more than a year. Batata, me and Percy. We left at 6:30 in the morning, only half an hour later than planned. It was one of those rare occasions when I get to see a day break in the city. 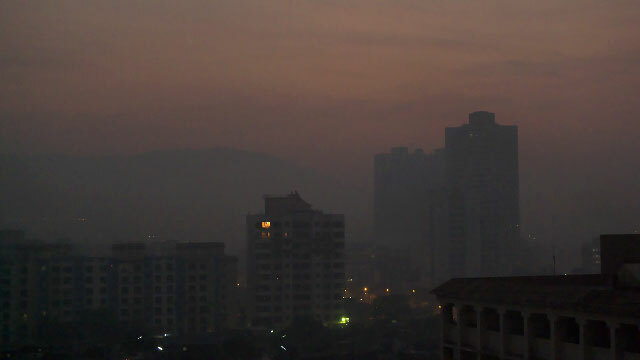 The ride to Panvel was uneventful and pleasant. Batata was waiting for us at Shri Datta Snacks. We waited among the hordes of weekend travelers for our chance at one of the few tables to eat. The missal here is hot and spicy. Tea after the missal is like liquid chili on the tongue. We left, making way for Chowk fata and then further on to Karjat. The road is in bad shape now. We took a short contemplation break at the base of the Matheran ghats where the roads forks. The ghat climb is exciting and refreshing. As we go up and up the surrounding countryside unfolds magically. The air develops a nip and you can smell the forest and its wildflowers. At Dasturi while parking Batata met with one of the employees of their school - the same dude we had shamelessly gotten our dinner from in the past. Because of him we could take advantage of the exemption of tourist tax and parking fees for people who have houses there. There were lots of people on the way, this being Sunday morning. We had a chitter chatter walk to the market. 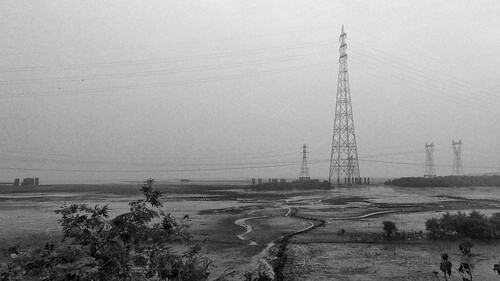 Pylons and Mudflats on the Thane creek.